How do I make the background of a Textview about 20% transparent (not fully transparent), where there is a color in the background (i.e. white)? In the example, CC is the hexadecimal number for 255 * 0.8 = 204. Note that the first two hexadecimal digits are for the alpha channel. The format is #AARRGGBB, where AA is the alpha channel, RR is the red channel, GG is the green channel and BB is the blue channel. I'm assuming that 20% transparent means 80% opaque. If you meant the other way, instead of CC use 33 which is the hexadecimal for 255 * 0.2 = 51. The range for the alpha channel is 8 bits (2^8=256), meaning the range goes from 0 to 255. Project the opaque percentage into the alpha range, that is, multiply the range (255) by the percentage. In this example 255 * 0.8 = 204. Round to the nearest integer if needed. Convert the value obtained in 3., which is in base 10, to hexadecimal (base 16). You can use Google for this or any calculator. Using Google, type "204 to hexa" and it will give you the hexadecimal value. In this case it is 0xCC. Prepend the value obtained in 4. to the desired color. For example, for red, which is FF0000, you will have CCFF0000. 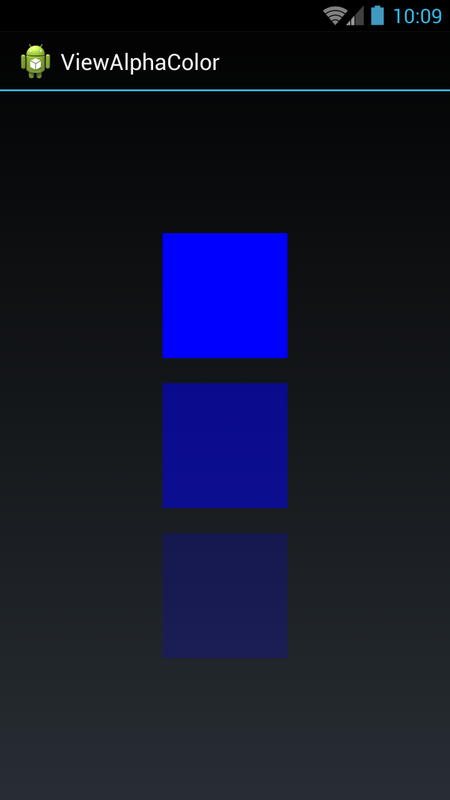 You can take a look at the Android documentation for colors. 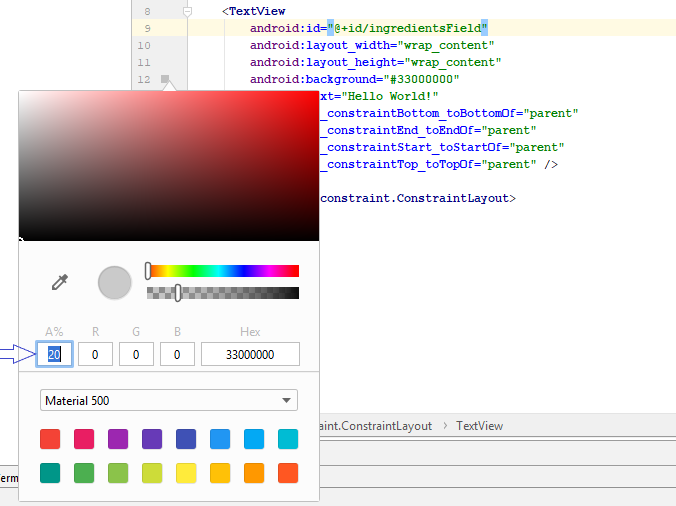 Use a color with an alpha value like #33------, and set it as background of your editText using the XML attribute android:background=" ". Here you can set the opacity between 0 (fully transparent) to 255 (completely opaque). The 51 is exactly the 20% you want. I have taken three Views. In the first view I set full (no alpha) color, on the second view I set half (0.5 alpha) color, and on the third view I set light color (0.2 alpha). There is an XML value alpha that takes double values. We can make transparent in this way also. 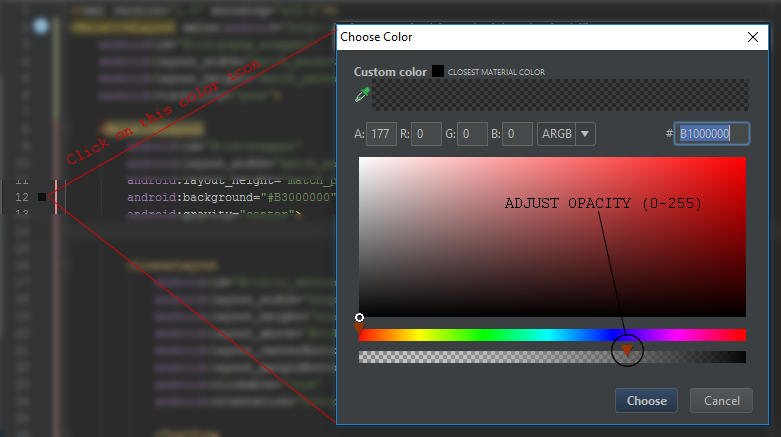 Just click on a color in Android studio editor and provide Alpha value in percentage. Where the INT ranges from 0 (fully transparent) to 255 (fully opaque). Its an fully transparent hex code - "#00000000"
Not the answer you're looking for? Browse other questions tagged android transparency android-textview or ask your own question. 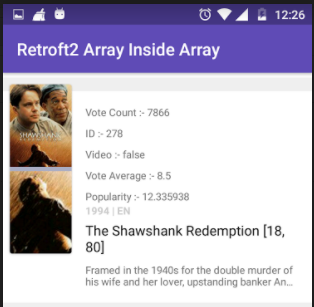 How to create transparent activity in android? How to set transparency of Navigation drawer background? Android: Adding shadow to all sides of button? How do I make links in a TextView clickable? How to change or add theme to Android Studio?